For other uses, see San Marino (disambiguation). List of countries by Human Development Index#UN member states (latest UNDP data). San Marino (/ˌsæn məˈriːnoʊ/ ( listen), Italian: [san maˈriːno]), officially the Republic of San Marino (Italian: Repubblica di San Marino), also known as the Most Serene Republic of San Marino (Italian: Serenissima Repubblica di San Marino), is an enclaved microstate surrounded by Italy, situated on the Italian Peninsula on the northeastern side of the Apennine Mountains. Its size is just over 61 km2 (24 sq mi), with a population of 33,562. Its capital is the City of San Marino and its largest settlement is Dogana in the municipality of Serravalle. San Marino has the smallest population of all the members of the Council of Europe. With Italian being the official language, along with strong financial and ethno-cultural connections, San Marino maintains close ties to its much larger neighbour; it is located close to the riviera of Rimini, one of Italy's main coastal resort areas. The country derives its name literally from Saint Marinus, a stonemason originating from the Roman colony on the island of Rab, in modern-day Croatia. 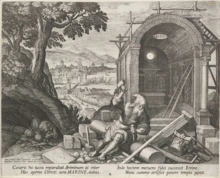 In AD 257,[clarification needed] Marinus, according to legend, participated in the reconstruction of Rimini's city walls after their destruction by Liburnian pirates. Marinus then went on to found an independent monastic community on Monte Titano in AD 301; thus, San Marino lays claim to be the oldest extant sovereign state as well as the oldest constitutional republic. 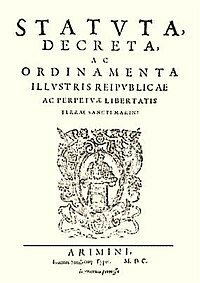 San Marino is governed by the Constitution of San Marino (Leges Statutae Republicae Sancti Marini), a series of six books written in Latin in the late 16th century, that dictate the country's political system, among other matters. The country is considered to have the earliest written governing documents, or constitution, still in effect. The country's economy mainly relies on finance, industry, services and tourism. It is among one of the wealthiest countries in the world in terms of GDP (per capita), with a figure comparable to the most developed European regions. San Marino is considered to have a highly stable economy, with one of the lowest unemployment rates in Europe, no national debt and a budget surplus, and has the world's highest rate of car ownership, being the only country with more vehicles than people. Saint Marinus left the island of Rab in present-day Croatia with his lifelong friend Leo, and went to the city of Rimini as a stonemason. After the Diocletianic Persecution following his Christian sermons, he escaped to the nearby Monte Titano, where he built a small church and thus founded what is now the city and state of San Marino, which is sometimes still called the "Titanic Republic". The official date of the founding of what is now known as the Republic is 3 September 301. In 1320 the community of Chiesanuova chose to join the country. In 1463 San Marino was extended with the communities of Faetano, Fiorentino, Montegiardino, and Serravalle, after which the country's border have remained unchanged. In 1631, its independence was recognized by the Papacy. The advance of Napoleon's army in 1797 presented a brief threat to the independence of San Marino, but the country was saved from losing its liberty thanks to one of its Regents, Antonio Onofri, who managed to gain the respect and friendship of Napoleon. Thanks to his intervention, Napoleon, in a letter delivered to Gaspard Monge, scientist and commissary of the French Government for Science and Art, promised to guarantee and protect the independence of the Republic, even offering to extend its territory according to its needs. The offer was declined by the Regents, fearing future retaliation from other states' revanchism. During the later phase of the Italian unification process in the 19th century, San Marino served as a refuge for many people persecuted because of their support for unification. In recognition of this support, Giuseppe Garibaldi accepted the wish of San Marino not to be incorporated into the new Italian state. During World War I, when Italy declared war on Austria-Hungary on 23 May 1915, San Marino remained neutral and Italy adopted a hostile view of Sammarinese neutrality, suspecting that San Marino could harbour Austrian spies who could be given access to its new radiotelegraph station. Italy tried to forcibly establish a detachment of Carabinieri in the republic and then cut the republic's telephone lines when it did not comply. Two groups of ten volunteers joined Italian forces in the fighting on the Italian front, the first as combatants and the second as a medical corps operating a Red Cross field hospital. The existence of this hospital later caused Austria-Hungary to suspend diplomatic relations with San Marino. Following the conclusion of World War I, San Marino suffered from high rates of unemployment and inflation, leading to increased tensions between the lower and middle classes. The latter, fearing that the moderate government of San Marino would make concessions to the lower class majority, began to show support for the Sammarinese Fascist Party (Partito Fascista Sammarinese), founded in 1922 and styled largely off their Italian counterpart. PFS rule lasted from 1923 to 1943, and, during this time, they often sought support from Benito Mussolini's fascist government in Italy. During World War II, San Marino remained neutral, although it was wrongly reported in an article from The New York Times that it had declared war on the United Kingdom on 17 September 1940. The Sammarinese government later transmitted a message to the British government stating that they had not declared war on the United Kingdom. Three days after the fall of Benito Mussolini in Italy, PFS rule collapsed and the new government declared neutrality in the conflict. The Fascists regained power on 1 April 1944 but kept neutrality intact. Despite that, on 26 June 1944, San Marino was bombed by the Royal Air Force, in the belief that San Marino had been overrun by German forces and was being used to amass stores and ammunition. The Sammarinese government declared on the same day that no military installations or equipment were located on its territory, and that no belligerent forces had been allowed to enter. San Marino accepted thousands of civilian refugees when Allied forces went over the Gothic Line. In September 1944, it was briefly occupied by German forces, who were defeated by Allied forces in the Battle of San Marino. San Marino had the world's first democratically elected communist government – a coalition between the Sammarinese Communist Party and the Sammarinese Socialist Party, which held office between 1945 and 1957. 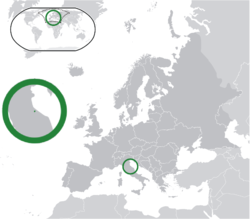 San Marino is the world's smallest republic, although when Nauru gained independence in 1968 it challenged that claim, Nauru's land mass being only 21 km2 (8.1 sq mi). However Nauru's jurisdiction over its surrounding waters covers 431,000 km2 (166,000 sq mi), an area thousands of times greater than the territory of San Marino. 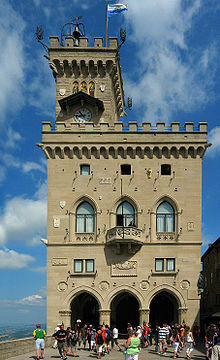 San Marino became a member of the Council of Europe in 1988 and of the United Nations in 1992. It is neither a member of the European Union, nor of the Eurozone although it uses the euro as its currency. San Marino is an enclave (landlocked) surrounded by Italy in Southern Europe, on the border between the regioni of Emilia Romagna and Marche and about 10 km (6.21 mi) from the Adriatic coast at Rimini. Its hilly topography, with no flat ground, is part of the Apennine mountain range. The highest point in the country, the summit of Monte Titano, is 749 m (2,457 ft) above sea level. There are no bodies of water of any significant size. San Marino has the political framework of a parliamentary representative democratic republic: the Captains Regent are both heads of state and heads of government, and there is a pluriform multi-party system. Executive power is exercised by the government. Legislative power is vested in both the government and the Grand and General Council. The judiciary is independent of the executive and the legislature. San Marino was originally led by the Arengo, initially formed from the heads of each family. In the 13th century, power was given to the Grand and General Council. In 1243, the first two Captains Regent were nominated by the Council. As of 2016[update], this method of nomination is still in use. The legislature of the republic is the Grand and General Council (Consiglio grande e generale). The Council is a unicameral legislature with 60 members. There are elections every five years by proportional representation in all nine administrative districts. These districts (townships) correspond to the old parishes of the republic. Citizens 18 years or older are eligible to vote. Beside general legislation, the Grand and General Council approves the budget and elects the Captains Regent, the State Congress (composed of ten Secretaries with executive power), the Council of Twelve (which forms the judicial branch during the period of legislature of the Council), the Advising Commissions, and the Government Unions. The council also has the power to ratify treaties with other countries. The council is divided into five different Advising Commissions consisting of fifteen councillors who examine, propose, and discuss the implementation of new laws that are on their way to being presented on the floor of the council. Every six months, the council elects two Captains Regent to be the heads of state. The Regents are chosen from opposing parties so that there is a balance of power. They serve a six-month term. The investiture of the Captains Regent takes place on 1 April and 1 October in every year. Once this term is over, citizens have three days in which to file complaints about the Captains' activities. If they warrant it, judicial proceedings against the ex-head(s) of state can be initiated. The practice of having two heads of state, like Roman consuls, chosen in frequent elections, is derived directly from the customs of the Roman Republic. The Council is equivalent to the Roman Senate; the Captains Regent, to the consuls of ancient Rome. It is thought the inhabitants of the area came together as Roman rule collapsed to form a rudimentary government for their own protection from foreign rule. San Marino is a multi-party democratic republic. A new election law in 2008 raised the threshold for small parties entering Parliament, causing political parties to organise themselves into two alliances: the right-wing Pact for San Marino, led by the San Marinese Christian Democratic Party; and the left-wing Reforms and Freedom, led by the Party of Socialists and Democrats, a merger of the Socialist Party of San Marino and the former communist Party of Democrats. The 2008 general election was won by the Pact for San Marino with 35 seats in the Grand and General Council against Reforms and Freedom's 25. 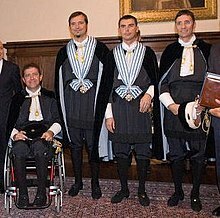 On 1 October 2007, Mirko Tomassoni was elected as among the heads of state, making him the first disabled person ever to have been elected as captain regent. San Marino has had more female heads of state than any other country: 15 as of October 2014, including three who served twice. With regard to the legal profession, while the Order of Lawyers and Notaries of the Republic of San Marino [Ordine degli Avvocati e Notai della Repubblica di San Marino] exists, there is no clear indication as to how demographic groups have fared in the legal field. The largest settlement of the Republic is Dogana, which is not an autonomous castello, but rather belongs to the Castello of Serravalle. San Marino's military forces are among the smallest in the world. National defence is, by arrangement, the responsibility of Italy's armed forces. Different branches have varied functions, including: performing ceremonial duties; patrolling borders; mounting guard at government buildings; and assisting police in major criminal cases. The police are not included in the military of San Marino. Once at the heart of San Marino's army, the Crossbow Corps is now a ceremonial force of approximately 80 volunteers. Since 1295, the Crossbow Corps has provided demonstrations of crossbow shooting at festivals. Its uniform design is medieval. While still a statutory military unit, the Crossbow Corps has no military function today. The Guard of the Rock is a front-line military unit in the San Marino armed forces, a state border patrol, with responsibility for patrolling borders and defending them. In their role as Fortress Guards they are responsible for guarding the Palazzo Pubblico in San Marino City, the seat of national government. In this role they are the forces most visible to tourists, and are known for their colourful ceremony of Changing the Guard. Under the 1987 statute the Guard of the Rock are all enrolled as "Criminal Police Officers" (in addition to their military role) and assist the police in investigating major crime. 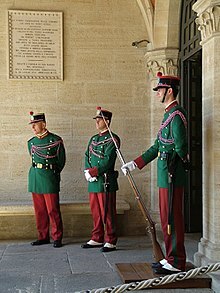 The uniform of the Guard of the Rock is a distinctive red and green. The Guard of the Grand and General Council commonly known as The Guard of the Council or locally as the "Guard of Nobles", formed in 1740, is a volunteer unit with ceremonial duties. Due to its striking blue, white, and gold uniform, it is perhaps the best-known part of the Sammarinese military, and appears on countless postcard views of the republic. The functions of the Guard of the Council are to protect the Captains Regents, and to defend the Grand and General Council during its formal sessions. They also act as ceremonial bodyguards to government officials at both state and church festivals. In former times, all families with two or more adult male members were required to enroll half of them in the Company of Uniformed Militia. This unit remains the basic fighting force of the armed forces of San Marino, but is largely ceremonial. It is a matter of civic pride for many Sammarinese to belong to the force, and all citizens with at least six years residence in the republic are entitled to enroll. Formally this is part of the Army Militia, and is the ceremonial military band of San Marino. It consists of approximately 50 musicians. The uniform is similar to that of the Army Militia. Military Ensemble music accompanies most state occasions in the republic. Established in 1842, the Gendarmerie of San Marino is a militarised law enforcement agency. Its members are full-time and have responsibility for the protection of citizens and property, and the preservation of law and order. The entire military corps of San Marino depends upon the co-operation of full-time forces and their retained (volunteer) colleagues, known as the Corpi Militari Volontari, or Voluntary Military Force. Tourism and banking are the country's main source of revenue. Although San Marino is not a European Union member, it is allowed to use the euro as its currency by arrangement with the Council of the European Union; it is also granted the right to use its own designs on the national side of the euro coins. Before the euro, the Sammarinese lira was pegged to, and exchangeable with, the Italian lira. The small number of Sammarinese euro coins, as was the case with the lira before it, are primarily of interest to coin collectors. San Marino's per capita GDP and standard of living are comparable to that of Italy. Key industries include banking, electronics, and ceramics. The main agricultural products are wine and cheese. San Marino imports mainly staple goods from Italy. San Marino's postage stamps, which are valid for mail posted in the country, are mostly sold to philatelists and are an important source of income. San Marino is a member of the Small European Postal Administration Cooperation. The corporate profits tax rate in San Marino is 19%. Capital gains are subject to a five per cent tax; interest is subject to a 13% withholding tax. In 1972, a value-added tax (VAT) system was introduced in Italy, and was applied in San Marino, in accordance with the 1939 friendship treaty. In addition, a tax on imported goods, to be levied by San Marino, was established. Such taxes, however, were not, and are not, applied to national products. Until 1996, goods manufactured and sold in San Marino were not subject to indirect taxation. Under the European Union customs agreement, San Marino continues to levy taxes, the equivalent of an import duty, on imported goods. Also, a general VAT was introduced, in replacement of the Italian VAT. The tourism sector contributes over 22% of San Marino's GDP, with approximately 2 million tourists having visited in 2014. San Marino and Italy have engaged in conventions since 1862, dictating some economic activities in San Marino's territory. Cultivation of tobacco and production of goods which are subject to Italy's government monopoly are forbidden in San Marino. Direct import is forbidden: all goods coming from a third party have to travel through Italy before reaching the country. Although it is allowed to print its own postal stamps, San Marino is not allowed to coin its own currency and is obliged to use Italy's mint; the agreement does not affect the right of the Republic of San Marino to continue to issue gold coins denominated in Scudi (legal value of 1 gold Scudo is 37.50 euros). Gambling is legal and regulated; however, casinos were outlawed prior to 2007. There is currently one legally operating casino. In exchange for these limitations, Italy provides San Marino with an annual stipend, and at cost, sea salt (not more than 250 tonnes per year), tobacco (40 tonnes), cigarettes (20 tonnes) and matches (unlimited amount). At the border there are no formalities with Italy. However, at the tourist office visitors can purchase officially cancelled souvenir stamps for their passports. San Marino has a population of approximately 33,000, with 4,800 foreign residents, most of whom are Italian citizens. Another 12,000 Sammarinese live abroad (5,700 in Italy, 3,000 in the US, 1,900 in France and 1,600 in Argentina). The first census since 1976 was held in 2010. Results were expected by the end of 2011. However, 13% of families did not return their forms. The primary language spoken is Italian; Romagnol is also widely spoken. Alex De Angelis (born 1984 in San Marino) a Grand Prix motorcycle road racing World Champion. San Marino is a predominantly Catholic state—over 97% of the population profess the Roman Catholic faith, but Catholicism is not an established religion. Approximately half of those who profess to be Catholic practice the faith. There is no episcopal see in San Marino, although its name is part of the present diocesan title. Historically, the various parishes in San Marino were divided between two Italian dioceses, mostly in the Diocese of Montefeltro, and partly in the Diocese of Rimini. 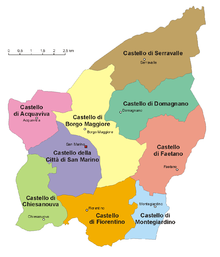 In 1977, the border between Montefeltro and Rimini was readjusted so that all of San Marino fell within the diocese of Montefeltro. The bishop of Montefeltro-San Marino resides in Pennabilli, in Italy's province of Pesaro e Urbino. However, there is a provision under the income tax rules that the taxpayers have the right to request for allocation of 0.3% of their income tax to the Catholic Church or to "other" charities. The churches include the two religious groups of the Waldensian Church and Jehovah's Witnesses. The Roman Catholic Diocese of San Marino-Montefeltro was until 1977 the historic diocese of Montefeltro. It is a suffragan of the archdiocese of Ravenna-Cervia. The current diocese includes all the parishes of San Marino. The earliest mention of Montefeltro, as Mona Feretri, is in the diplomas by which Charlemagne confirmed the donation of Pepin. The first known bishop of Montefeltro was Agatho (826), whose residence was at San Leo. Under Bishop Flaminios Dondi (1724) the see was again transferred to San Leo, but later it returned to Pennabilli. The historic diocese was a suffragan of the archdiocese of Urbino. Since 1988, there is formally an apostolic nunciature to the republic, but it is vested in the nuncio to Italy. There has been a Jewish presence in San Marino for at least 600 years. The first mention of Jews in San Marino dates to the late 14th century, in official documents recording the business transactions of Jews. There are many documents throughout the 15th to 17th centuries describing Jewish dealings and verifying the presence of a Jewish community in San Marino. Jews were permitted official protection by the government. During World War II, San Marino provided a haven for more than 100,000 Italians and Jews (approximately 10 times the Sammarinese population at the time) from Nazi persecution. Today, only a few Jews remain. There are 220 km (140 mi) of roads in the country, the main road being the San Marino Highway. Authorities license private vehicles with distinctive Sammarinese license plates, which are white with blue figures and the coat of arms, usually a letter followed by up to four numbers. Many vehicles also carry the international vehicle identification code (in black on a white oval sticker), which is "RSM". There are no public airports in San Marino, but there is a small private airstrip located in Torraccia and an international heliport located in Borgo Maggiore. Most tourists who arrive by air land at Federico Fellini International Airport close to the city of Rimini, then make the transfer by bus. Two rivers flow through San Marino, but there is no major water transport, and no port or harbour. San Marino has limited public transport facilities. There is a regular bus service between Rimini and the city of San Marino that is popular with both tourists and workers commuting to San Marino from Italy. This service stops at approximately 20 locations in Rimini and within San Marino, with its two terminus stops at Rimini railway station and San Marino coach station. A limited licensed taxi service operates nationwide. There are seven licensed taxi companies operating in the republic, and Italian taxis regularly operate within San Marino when carrying passengers picked up in Italian territory. There is a 1.5 km (0.93 mi) aerial tramway connecting the City of San Marino on top of Monte Titano with Borgo Maggiore, a major town in the republic, with the second largest population of any Sammarinese settlement. From here a further connection is available to the nation's largest settlement, Dogana, via the local bus service. Two aerial tramway cars (gondolas) operate, with service provided at roughly 15-minute intervals throughout the day. A third vehicle is available on the system, a service car for the use of engineers maintaining the tramway. Today, there is no railway in San Marino, but for a short period before World War II, it had a single narrow-gauge line called the Ferrovia Rimini–San Marino which connected the country with the Italian rail network at Rimini. Because of the difficulties in accessing the capital, City of San Marino, with its mountain-top location, the terminus station was planned to be located in the village of Valdragone, but was extended to reach the capital through a steep and winding track comprising many tunnels. The railway was opened on 12 June 1932. An advanced system for its time, it was an electric railway, powered from overhead cables. It was well built and had a high frequency of passengers, but was almost completely destroyed during World War II. Many facilities such as bridges, tunnels, and stations remain visible today, and some have been converted to parks, public footpaths, or traffic routes. The Three Towers of San Marino are located on the three peaks of Monte Titano in the capital. They are depicted on both the Flag of San Marino and its coat of arms. The three towers are: Guaita, the oldest of the three (it was constructed in the 11th century); the 13th-century Cesta, located on the highest of Monte Titano's summits; and the 14th-century Montale, on the smallest of Monte Titano's summits, still privately owned. The Università degli Studi della Repubblica di San Marino (University of the Republic of San Marino) is the main university, which includes the Scuola Superiore di Studi Storici di San Marino (Advanced School of Historical Studies), a distinguished research and advanced international study centre governed by an international Scientific Committee coordinated by professor Luciano Canfora. Other important institutes are the Istituto Musicale Sammarinese (Sammarinese Musical Institute) and the Akademio Internacia de la Sciencoj San Marino or Accademia Internazionale delle Scienze San Marino (International Academy of Sciences San Marino). The latter is known for adopting Esperanto as the language for teaching and for scientific publications; further, it makes wide use of electronic educational technology (also called e-learning). Italian author Umberto Eco had attempted to create a "university without physical structures" in San Marino. In San Marino football is the most popular sport. Basketball and volleyball are also popular. The three sports have their own federations, the San Marino Football Federation, the San Marino Basketball Federation and the San Marino Volleyball Federation. Despite being the most popular sport, the San Marino national football team has had little success, being made up of part-timers, never qualifying for a major tournament, and recording only one win in over 25 years of its history, a 1–0 victory in 2004 against Liechtenstein. They have drawn four more, with their most notable result being a 1993 0–0 draw with Turkey during the European qualifiers for the 1994 FIFA World Cup. Despite being among the worst teams in the world, they used to hold the record for the fastest goal scored in international football (since broken by Christian Benteke), with David Gualtieri scoring 8.3 seconds after the start of a match against the England national football team in 1993, which they went on to lose 7–1, in the final round of the same World Cup qualifiers. 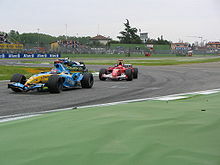 A Formula One race, the San Marino Grand Prix, was named after the state, although it did not take place there. Instead, it was held at the Autodromo Enzo e Dino Ferrari in the Italian town of Imola, about 100 km (60 mi) northwest of San Marino. This international event was removed from the calendar in 2007. The San Marino and Rimini's Coast motorcycle Grand Prix was reinstated in the schedule in 2007 and takes place at the Misano World Circuit Marco Simoncelli, as does San Marino's round of the World Superbike Championship. San Marino has a professional baseball team which plays in Italy's top division. It has participated in the European Cup tournament for the continent's top club sides several times, hosting the event in 1996, 2000, 2004, and 2007. It won the championship in 2006 and was a runner-up in 2010. Together with Italy, San Marino will host the 2019 UEFA European Under-21 Championship, with teams playing at the Stadio Olimpico in Serravalle. San Marino has had little success at the Olympic Games, winning no medals. 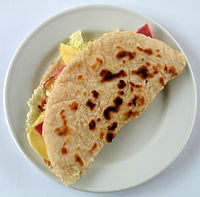 The cuisine of San Marino is extremely similar to Italian, especially that of the adjoining Emilia-Romagna and Marche regions, but it has a number of its own unique dishes and products. Its best known is probably the Torta Tre Monti ("Cake of the Three Mountains" or "Cake of the Three Towers"), a wafer layered cake covered in chocolate depicting the Three Towers of San Marino. The country also has a small wine industry. The site San Marino: Historic Centre and Mount Titano became part of the UNESCO World Heritage List in 2008. The decision was taken during the 32nd Session of the UNESCO World Heritage Committee composed of 21 Countries convened in Québec, Canada. The country has a long and rich musical tradition, closely linked to that of Italy, but which is also highly independent in itself. A well-known 17th century composer is Francesco Maria Marini. San Marino has taken part in the Eurovision Song Contest eight times, achieving its first final in 2014 with the third participation of Valentina Monetta and the song "Maybe". ^ a b c d e f g h "San Marino". The World Factbook. Central Intelligence Agency. ^ a b c "San Marino". Encyclopædia Britannica. 2012. Retrieved 1 March 2011. ^ a b c d San Marino. Imf.org. 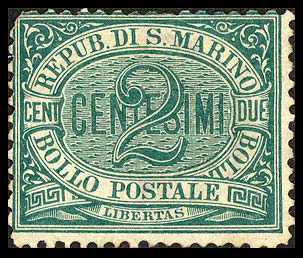 ^ "San Marino" (PDF). UNECE Statistics Programme. UNECE. 2009. Retrieved 13 March 2010. ^ "Informazioni sulla popolazione – Repubblica di San Marino, portale ufficiale". Sanmarino.sm. Archived from the original on 12 November 2016. Retrieved 11 November 2016. 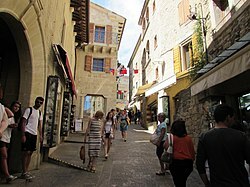 ^ "Europe's Micro-States: (04) San Marino". Deutsche Welle. 24 July 2014. Retrieved 28 July 2014. ^ "The United States has "the longest surviving constitution."". PolitiFact.com. Retrieved 26 September 2012. ^ Planet, Lonely. "San Marino – Lonely Planet". Lonely Planet. Retrieved 18 November 2016. ^ Charles, comte de Bruc, The Republic of San Marino (Cambridge: 1880). ^ "From 1500 to beginning 1800, Napoleon in San Marino". Sanmarinosite.com. Archived from the original on 18 May 2009. Retrieved 24 October 2009. ^ Histoire abrégée des traités de paix entre les puissances de l'Europe depuis la Paix de Westphalie, Christophe-Guillaume Koch, ed., Paris, 1817, vol. V, p. 19. ^ "San Marino". United States Diplomatic History. U. S. Department of State. Retrieved 29 May 2011. 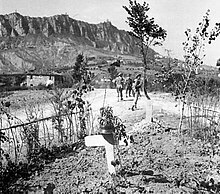 ^ "San Marino e la Prima Guerra Mondiale". Educazione.sm. Retrieved 24 October 2009. ^ Valentina. "World Wars and Fascism in San Marino". Sanmarinosite.com. San Marino Site Turismo. Retrieved 28 February 2019. ^ "GALES SCATTER NAZI CHANNEL FLEETS; ITALIANS THRUST DEEPER INTO EGYPT (9/18/40)". 209.157.64.200. 18 September 2010. Retrieved 16 September 2013. ^ "Guerre Mondiali e Fascismo nella storia di San Marino". Sanmarinosite.com. Archived from the original on 10 April 2014. Retrieved 24 October 2009. ^ Manali Desai (27 November 2006). State Formation and Radical Democracy in India. Taylor & Francis. p. 142. ISBN 978-0-203-96774-4. Retrieved 31 August 2013. ^ "Fishery and Aquaculture Country Profiles: Nauru". Food and Agriculture Organization of the United Nations. Retrieved 27 May 2010. ^ "San Marino weather averages". World Weather Online. Retrieved 15 June 2015. ^ "San Marino, primo capo di Stato disabile "Via tutte le barriere architettoniche" – esteri". Repubblica.it. 1 October 2007. Retrieved 24 October 2009. ^ "Turismo: San Marino fa i conti con la recessione economica, l'Italia guarda con fiducia al 2010" (in Italian). San Marino RTV. 11 January 2010. Retrieved 13 March 2010. ^ "Tourists flows" (PDF). statistica.sm. Statistical Office of San Marino. Archived from the original (PDF) on 22 December 2015. Retrieved 16 December 2015. ^ "Convenzioni Bilaterali – Accordi bilaterali con l'Italia" (in Italian). Segreteria di stato per gli affari esteri e politici. Archived from the original on 4 January 2013. Retrieved 28 December 2012. ^ "Convenzione monetaria tra la Repubblica Italiana, per conto della Comunità europea, e la Repubblica di San Marino". ^ "Convenzione di amicizia e buon vicinato 1939 (1980 transcript)" (PDF) (in Italian). 1980. Archived from the original (PDF) on 3 May 2016. Retrieved 28 December 2012. ^ World and Its Peoples. Marshall Cavendish. 2009. p. 856. ISBN 0-7614-7893-0. ^ "Diocese of San Marino-Montefeltro". Catholic-Hierarchy.org. David M. Cheney. Retrieved 21 January 2015. ^ Knight, Kevin (2009). "Diocese of Montefeltro". newadvent.org. Retrieved 25 November 2012. ^ "San Marino". 1906 Jewish Encyclopedia. JewishEncyclopedia.com. Retrieved 25 November 2012. ^ "La". Publibook. Archived from the original on 9 October 2014. ^ Sheib, Ariel. "Virtual Jewish history tour: San Marino". jewishvirtuallibrary.org. Retrieved 25 November 2012. ^ "Università degli Studi di San Marino". Unirsm.sm. Retrieved 24 October 2009. ^ "Istituto Musicale Sammarinese". Ims.sm. Retrieved 24 October 2009. ^ "Accademia Internazionale delle Scienze". Ais-sanmarino.org. Retrieved 24 October 2009. ^ "Umberto Eco biography". Liquidsky.net. 16 January 1994. Retrieved 16 September 2013. ^ "SAN MARINO VS. LIECHTENSTEIN 1 – 0". Soccerway. Retrieved 15 March 2017. ^ "San Marino v Turkey". Scoreshelf. Archived from the original on 16 March 2017. Retrieved 15 March 2017. ^ "Christian Benteke nets fastest international goal in 8.1 seconds". Espnfc.com. Retrieved 16 March 2017. ^ "2008 Mister-Baseball Final European Top 50 – fact, certain, about, 2008, European, baseball, season, club, dominated, This". Mister Baseball. 6 November 2007. Retrieved 24 October 2009. Wikimedia Commons has media related to San Marino. Wikisource has the text of The New Student's Reference Work article "San Marino". San Marino is a small European republic, with limited public transport facilities. It is an enclave in central Italy. The principal public transport links involve buses, helicopters, and an aerial tramway. There was a public rail network, a small part of which is preserved. The Sammarinese Armed Forces refers to the national military defence forces of the country of San Marino. It is one of the smallest military forces in the world, with its different branches having varied functions including: performing ceremonial duties; patrolling borders; mounting guard at government buildings; and assisting police in major criminal cases. There is also a military Gendarmerie which is part of the military forces of the republic. The entire military corps of San Marino depends upon the co-operation of full-time forces and their retained (volunteer) colleagues, known as the Corpi Militari Volontari, or Voluntary Military Force. National defence in the face of an aggressive world power is, by arrangement, the responsibility of Italy's armed forces. The component parts of the military are distinguished by distinctive cap badges, one each for the Fortress Guard (uniformed), Fortress Guard (artillery), Guard of the Council, Uniformed Militia, Military Ensemble (band), and Gendarmerie. There is no compulsory service, however under special circumstances citizens aged 16 to 55 may be drafted for the defence of the state. The City of San Marino (Italian: Città di San Marino) is the capital city of the Republic of San Marino, Southern Europe. The city has a population of 4,044. It is on the western slopes of San Marino's highest point, Monte Titano. Serravalle is a castello located in the European republic of San Marino. With a population of 10,878 inhabitants and a surface of 10.53 km², it is not only the most densely populated municipality in San Marino, but it also contains its largest settlement (Dogana). Serravalle is located on the edge of the Apennine Mountains. S.P. Tre Penne is a football club based in the City of San Marino. The club was founded in 1956, and currently plays in Girone B of Campionato Sammarinese di Calcio. The team colors were blue and white when home, and red when away. Later on the team color was changed to green. Stadio Olimpico di Serravalle is a multi-purpose stadium in Serravalle, San Marino. First opened in 1969, it is currently used mostly for football matches. It is the national stadium of San Marino, and is also used by the club San Marino Calcio, which plays in the Italian Serie D.
The Catholic Church in San Marino is part of the worldwide Catholic Church, under the leadership of the Pope in Rome. The coat of arms of San Marino probably originated in the fourteenth century. The official establishment took place on 6 April 1862 by a Decree of the Supreme Council; the same act introduced the crown on top of the shield. Monte Titano is a mountain of the Apennines and the highest peak in San Marino. It stands at 739 m (2,425 ft) above sea level and is located immediately to the east of the capital, San Marino. It was inscribed as a UNESCO World Heritage Site in 2008 under the combined title "San Marino Historic Centre and Mount Titano". Inscribed under reference no. 1245 criteria iii, the two together encompass an area of 55 ha with a buffer zone of 167 ha. It encompasses Mount Titano and the other structures such as the fortification towers, walls, gates and bastions, as well as a neo-classical basilica located on it and its slopes forming a small but unique urban conglomerate. Serbian-Sammarinese relations are foreign relations between Serbia and San Marino. Diplomatic relations between the Republic of Serbia and the Republic of San Marino were established by the exchange of Notes on February 14, 2002. The Sammarinese Fascist Party or PFS was a fascist political party that ruled San Marino from 1923 to 1943. Rovereta is a village (curazia) located in San Marino. It belongs to the municipality (castello) of Serravalle. Its name, in Italian language, refers to a wood of "Sessile Oaks".